trash: Choose an icebreaker (or any number of cloud icebreakers). Each chosen icebreaker has +1 strength for each link you have for the remainder of this run. Use this ability only during a run. Fortunately, Globalsec buys them by the case. In Sunny with Rabbit Hole and Security Nexus, this is BONKERS. It's basically like a Stimhack in terms of getting you into places in a pinch that you otherwise couldn't touch, but without the brain damage. I haven't gotten the deck working terribly well yet, but this has been an MVP. Sunny's breaker suite is unique, in that they each have a "break any number of subroutines" effect, but that continual 2-credit drain can be a drag. Enter Security Chip, a quick, affordable way for your link to help keep you running. 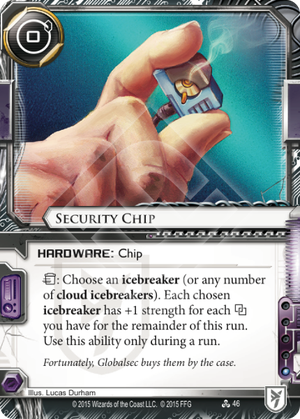 With Security Nexus, this card gives a +3 to all your cloud breakers. Throw in some Dyson Mem Chips, Access to Globalsec, or even Rabbit Hole, and you're suddenly getting a boost of five or more across the board for each use. Against high-strength ice, where the GS suite begins to become burdensome, this chip packs a high-value punch. It's also worth noting that Geist can also make use of this card, in order to speed up his available runs. Since the Breaking and Entering suite's strength is dependent upon the number of icebreakers in play, a sudden boost beyond their expected capabilities can be more than a little impactful, especially when you're stuck in a "Crap, I need to run, right now" scenario. Finally, it could be utilized with other runners with a link-based game plan. A couple decks on this site have constructed Iain variants, where his ability can serve to fuel the cost to keep the GS Suite up and running, and there's even one Andy decklist floating around. With Rabbit Hole, it would be interesting to see its application in Shaper, though I suspect that's bordering jank territory. Overall, I love the utility of this card, which can sit on the board as an idle threat of an inevitable hulked-out run, or simply lie in wait in the runner's grip, waiting for the right time to rain on the Corp's parade. I just started messing around with a Sunny deck, and while I have yet to actually fire a Security Chip, I'm excited for it. Since GS Striker M1 is so bad, I'm using Yog.0 + Datasucker as a decoder and one of these will help me recover from a purge that would otherwise lock me out of centrals or get past a Lotus Field if Security Nexus won't work for some reason.